I've been trying to reinvent my road bike as a do-all commuter, so it was in several pieces in the living room when my cats woke me up at an unspeakable hour this morning. I had a lot of time to kill before work (and my commute to work), but I wasn't looking forward to restarting my rack installation/tire changing/light mounting/pedal-swapping project. I decided I was going to take the Karate Monkey out for a morning spin on pavement before I finished fixing my preferred bike. But when I went to the basement to grab it, I noticed the seat was still on Pugsley (I still only own one saddle and seatpost for my Surlys, and I have to swap it out between the two.) I was so, so lazy this morning that I didn't even feel like turning a wrench on a seatpost clamp. I grabbed Pugsley instead. The tires were inflated to only about 7 or 8 psi from recent runs on soft snow, but I was so, so lazy that I didn't even want to put air in the tires. "Where can I go where it won't matter if I'm on bouncy wheels?" 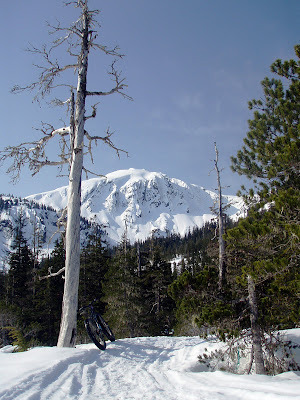 I only have to pedal a half mile from my house before I reach the Mount Jumbo access trail. 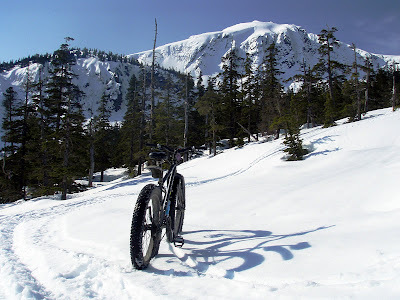 This was the first point in which I thought about snow biking today. Soft and punchy was the theme of the day, but rideable the snow still is - at least on slight inclines and downhills. It took only minutes to climb up to the meadow and just like that - a world apart. 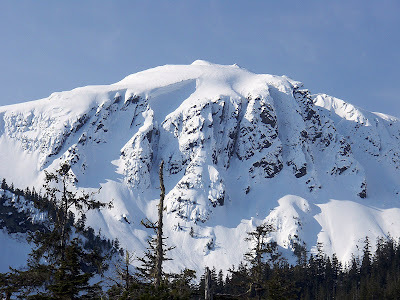 Mount Jumbo looked like avalanche central. It's hard to tell from the shadows in this photo, but to the immediate left of the peak, there is an overhanging ceiling of pure snow that must be at least 20 feet deep. I kept staring at it, waiting for a wall of powder to peel off the slope. 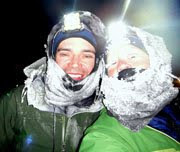 Meanwhile, I skirted along sidehills and made often-dead-ending efforts to stay far away from the mountain. Even so, there's still enough good terrain up there to consume a whole day. The snow pack is definitely rotting, and I was surprised to discover Pugsley was getting better float than I could. 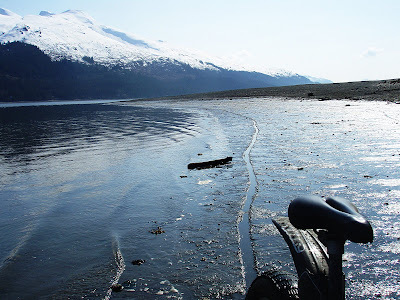 The going was always slow, but when I started fishtailing out of control, I would put my foot down only to sink thigh-deep in the oatmeal-like slush. Strange to climb out of that, get back on my bike, and start rolling again. After riding down, I took a detour onto the beach that, thanks to low tide, became a long detour. Crushing mussel shells, crunching over barnacle boulders and and mashing through sand put a big smile on my face. 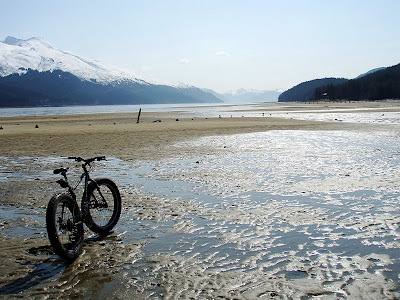 I was freewheeling again, loving life, loving Juneau, happy. It was exactly what I needed. Thanks, Pugsley. A great day in a great place. Best regards and happy trails. Those pictures are amazing! 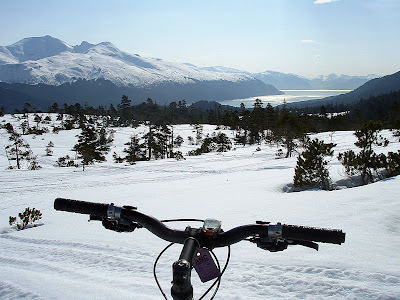 I can see why you love snow biking so much. I have fallen in love with your pictures and adventures since I found your blog site. I dream of being there while I am here at my desk in Salt Lake City. Wow, those shots are incredible! Glad to see you are happy again!! Bar har. You are crazy. That is good. This world needs more people pushing the boundaries of impossible. Good stuff. PS Saw your blog link from www.marijakozin.com's blog.